We're on the ground for a tense, emotionally complex dramatization of the Boston Marathon bombing. Four years ago, when the brawny blasts of Battleship could be heard from the snack bar of your local multiplex, Peter Berg was not necessarily the filmmaker you would have trusted to fashion a thoughtful, character-led drama around a real-life terror attack. Recently, however, he’s regained the personal touch of 2004’s Friday Night Lights: It’s just been amped up a bit. Mere months after Deepwater Horizon successfully married steely action smarts to a beating heart, he reteams with Mark Wahlberg for this muscular, street-level dramatization of 2013’s Boston Marathon bombing. Balancing the perspectives of perpetrators, policemen and victims with wiry tension and tender human interest, it’s not entirely the rah-rah flag-waving exercise the title promises; as Berg’s narrative expands across a city first paralyzed, then galvanized, by tragedy, the film culminates in a more inclusive celebration of community. 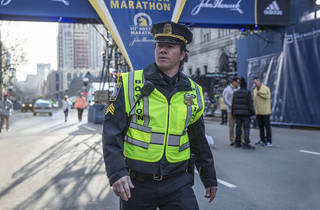 As fictionalized headstrong cop Tommy Saunders, who finds himself stationed at the marathon finish line when twinned explosions rupture the event, killing three and wounding hundreds, a sterling Wahlberg is only ostensibly the hero here. Rather, the film divides its attention generously between a host of valuable participants in the ensuing manhunt—from unglamorous local police sergeants to the courageous Chinese immigrant (Jimmy O. Yang) kidnapped by the panicked Chechen bombers. Nervily played by Alex Wolff and Themo Melikidze, they too are characterized with commendable restraint, neither demonized nor over-analyzed. Still, it’s one of the terrorist's wives (Melissa Benoist) who carries the film’s most riveting and provocative scene, staunchly defending their actions in the face of her unsparing interrogator (Khandi Alexander, scorching the screen in a few minutes flat). 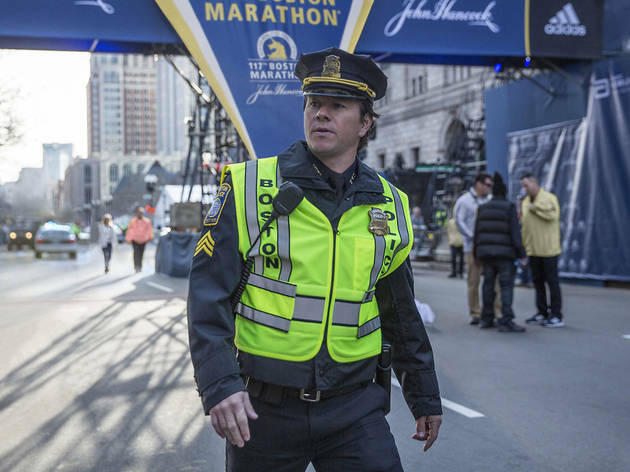 Amid its expert on-the-run action, Patriots Day does some of its best work while seated.